Egham 6th December, 2017 – Making short-run envelope printing viable and profitable and offering unprecedented creative potential, OKI Europe Ltd’s new Pro9 Envelope Print System enables print shops and print houses to take advantage of evolving trends in direct marketing. It also opens up new opportunities in printing invitations and other high quality mailed products. The Envelope System provides users of OKI’s Pro9 series Graphic Arts printers with the scope to differentiate their business on two counts. 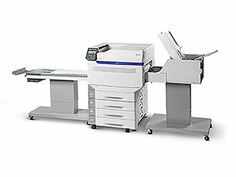 First it enables short runs of variable data envelope printing in less time than it takes to produce printing plates and ink up a press and without any set-up costs. Secondly, the Pro9542 Envelope System offers brilliant white and striking colour on colour envelopes – with exceptional, eye-catching results. “Despite the great rise in direct marketing via email, consumers still see direct mail as more personal and trustworthy. Research by the Direct Marketing Association shows that in spite of the increasing number of online promotions direct mail still outperforms email; for example, its research showed that only 44% could recall a brand after an email campaign whereas 75% could do so after receiving direct mail,” says Shun Mochizuki, Senior Marketing Manager, Small Format Printers, OKI Europe Ltd.
OKI’s Envelope Print System includes an envelope feeder and conveyer developed by OKI to help drive productivity. Easy to set up and with great media flexibility the Envelope System includes an Envelope Fuser to reduce wrinkle and ensure uniform print across a wide range of designs. It prints the broadest range of envelope sizes (C7 to 13” by 15”) at impressive speeds (up to 500 DL envelopes in under approximately 12 minutes).